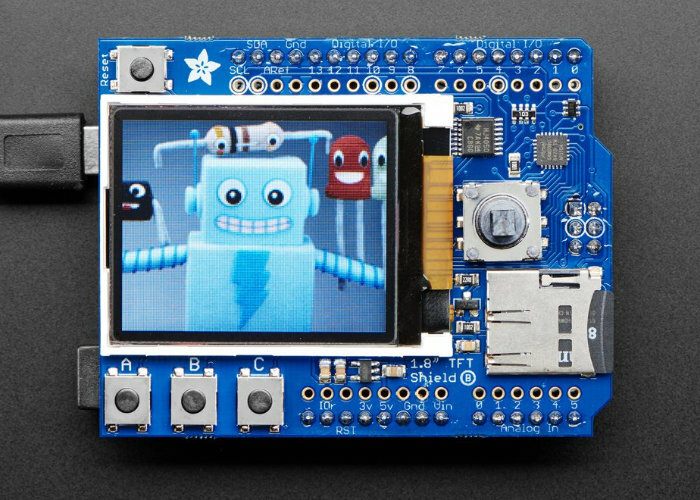 Adafruit has this week unveiled a new second-generation version of its popular 1.8 inch Colour TFT display which is now being combined with an Arduino shield fitted with a microSD card slot and a 5-way joystick navigation switch and three selection buttons. The 1.8″ display has 128×160 colour pixels an is a true TFT, using the ST7735R driver the display can provide full 18-bit colour or 262,144 shades. The shield has been updated to the Arduino R3 format providing compatibility for all Arduinos or Metros – including the Metro M0 or M4, Arduino Mega, Zero, etc. the shield is also equipped with Adafruit seesaw for the TFT backlight, TFT reset, and button inputs, enabling users to query the buttons and joystick over I2C now, so only 2 pins are needed to communicate with all 8 switches. The Adafruit 1.8″ Color TFT Shield w/microSD and Joystick version 2 is now available to purchase priced at $35, for full specifications and more details jump over to the official Adafruit online store by following the link below.